Increased industry wages are among the highlights of a new report about the Oregon wine industry. Portland, Ore.—The dramatic growth of the Oregon wine industry is paying off for workers, with wages rising faster than employment. The latest study of the Oregon wine industry’s economic impact, prepared by Full Glass Research of Berkeley, Calif., for the Oregon Wine Board, indicates that total industry wages were up 38% in 2013 from 2010, the last year examined. By contrast, employment rose just 26.5%, resulting in an increase in the average annual wage to $30,821 for the 17,099 workers in the industry. 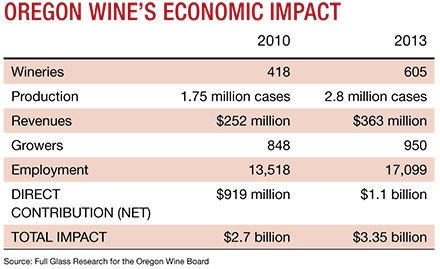 Overall, the economic impact of the state’s wine industry rose 24.1% between 2010 and 2013, to reach $3.35 billion. The surge in wages is directly related to consumer demand for Oregon wine, explained Tom Danowski, executive director of the Oregon Wine Board. Consumers have been willing to pay the prices producers are charging, which has supported prices and in turn wage growth. Wineries have been able to pay the talent needed to produce top-quality wine, Danowski told Wines & Vines. An improving economy also has supported the restaurant and retail sectors, for which the report draws on industry averages to extrapolate the sector’s impact. Indeed, the double-digit growth in wages comes on the back of dramatic growth in the industry itself: The state’s grape crop rose in value to $128 million in 2013 from $63.2 million in 2010, while production volumes rose 58.6% to approach 2.8 million cases (or 25 million liters) in 2013. Sales have followed suit, Danowski added, pointing to figures from ShipCompliant and Wines & Vines and from Nielsen indicating that growth in the state’s wine sales are as much as 3.5 times industry averages. Recently, everyone from newcomers from California who snapped up vineyard properties during the past 18 months to smaller operators seeking niche opportunities have seen opportunities in Oregon. Between 2010 and 2013, the report records that total wineries in the state increased 44.7% to 605, while the number of growers rose 12% to 950. But amid the increases were a couple of notable declines: the net economic contribution of the industry to the state’s economy, which the report terms “a measure of value added,” fell from $1.56 billion to $1.4 billion. “The decrease is entirely in the indirect/induced effects,” explained report author Christian Miller, principal of Full Glass, noting that the direct impact of grapegrowing and winemaking increased from $919 million to $1.1 billion. “Some of the decline in indirect impact is due to changes in methodology. Some may be due to a slowdown in the multiplier effect in the general Oregon economy,” he said. Similarly, while the industry appears to be paying $2 million less in taxes, the decline is entirely attributable to $6 million less attributed to indirect and induced tax effects. Miller expects exemptions for the plethora of start-up wineries in the state have contributed most to the drop in corporate taxes. Overall, however the report bears out a positive outlook for the state’s industry. Miller agrees, though he cautions against complacency in a summary of the report. Among the challenges are the small size of most wineries in the state, which render them less able to navigate the wholesale structures in place in many states.